This was a campaign site for Mercedes-Benz company cars I made at Basilicon in 2009. 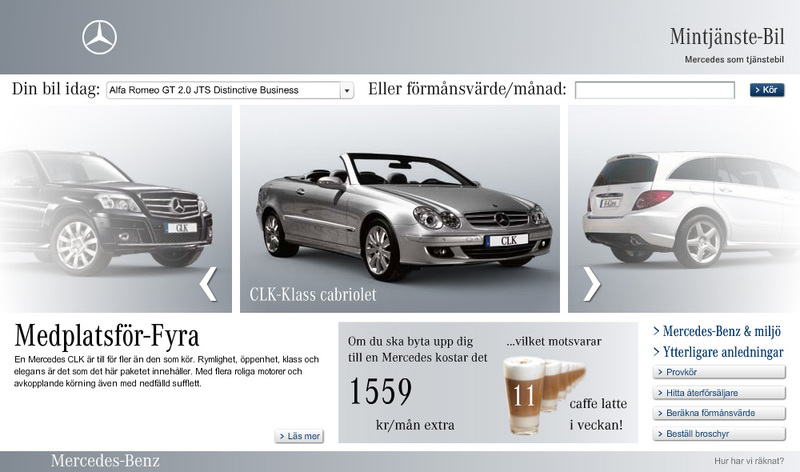 It was an flash application with a funny approach to comparing leasing costs for cars. Everything was measured in how many caffe lattes you saved each month. It was actually based on a similar campaign made by another web agency earlier. I got the assignment to redesign it so it matched Mercedes-Benz new corporate identity. But the project ended up being a lot bigger than that, since the wanted to update most car models and add pages with environmental information on so on. I also had to rewrite most of the code, since it was such bad design and so buggy from the start. So at the end I had rebuilt the whole application.